Someone once told me that I say the “wrong things.” Someone once told me that I don’t know how to be nice or express emotion. I won’t say any names, but whomever told me that knows “who” they are. To that person, I ask that they read these [few] poems, and then ask themselves if they can say the same. Within this book, I’ve aggregated each and every poem I have ever written, as well as a collection of some of my favorite lyrics that provided inspiration for my own works. 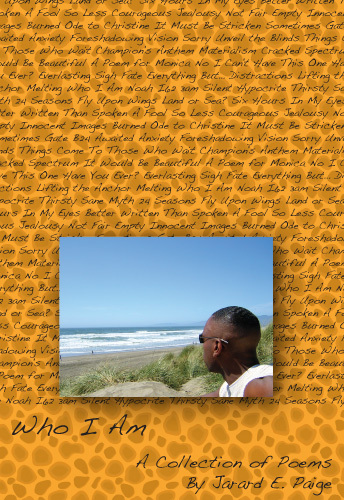 The title piece “Who I Am” was the culmination of my writing adventures. Prior to that time, I’d spent so much of my energy writing about things I wished I would do or could say. After writing this piece, I decided to put that part of myself to rest and to focus on making the most out of the experiences within my life. Even though “the last time I picked up a pen to write of things hidden within” was seven years ago, I find it interesting that as much as I’ve grown as a person, I’m still the same person at my core. Seven years ago, and even more now, I’m always trying to see the sunnier side of the situation during challenging moments. Each of these 42 bodies of work were indescribable explosions of ideas. Each was written in one sitting and completed in one draft. Looking back on these works, I can remember the inspiration for each…whether a song, a situation, a woman, or a dream…and I can honestly say that this is a fair interpretation of my life, my thoughts, desires, and dreams. Though I did not have the strength to reread many of these works in the past seven years, I am now confident enough in myself and these works to share my pride with others. I hope that you enjoy the writings I’ve collected in this book, and just maybe, they might assist you in your life in some capacity. Thank you and enjoy!